Nose Graze — Young Adult book reviewsTandem is a fun and original new take on parallel universes! I think this book really proves how you can take a similar idea and twist it into something totally different. I got hooked on the idea of parallel universes after reading Parallel by Lauren Miller. But despite both books being about parallel universes, they are both completely different. Actually, now that I think about it, if anything, the parallel universe concept in Tandem is similar to The Golden Compass by Philip Pullman.Tandem is far from lacking in the swoony boys department! I adored the romance in this book. There is a bit of a love triangle, but it's honestly not really a love triangle because although there are two boys in the picture, Sasha only has her eyes on one of them. I loved both guys though. Thomas is... well, he's kind of perfect. He's a high ranking security guy, which means he's pretty grown up and badass (despite being a teenager). But he's also a really, genuinely amazing guy. He promises to never lie to Sasha, and he doesn't! Throughout the entire book! And considering that he's a high up military guy in another universe, that kind of says a lot. Thomas is sweet, hot, romantic, and all around just deeeliiiicious!Then we have Callum. Callum is super different from Thomas, but he's also a nice guy. He's a prince in the parallel world, but he's so down to earth. He acts just like a regular, nice, high school guy. But that's why I felt so bad for Callum. Sasha has to enter a parallel universe and pretend to be her parallel self (princess Juliana), because the real Juliana was kidnapped. But Callum thinks that Sasha is really Juliana, the woman he's been arranged to marry. So he's trying to really get to know her and ease into some kind of intimate life, since they'll be married... but Sasha has no intention of staying in this parallel universe forever. And I just felt so, so bad for Callum who was a nice guy trying to make the most of an arranged marriage, but little did he know that he wasn't even talking to the real princess Juliana this whole time! I just wanted to hug him.I think the world building is definitely where Tandem was lacking. Some parts of the world building were done pretty well, like going over the idea of parallel universes and the science behind them—that was all fine. But the actual parallel universe that we spend most of the book in wasn't built up very well. There's clearly a ton of political unrest. There are two main kingdoms, which are divided up in the United States. But then there's also a rebellion group trying to dismantle both kingdoms and form like a democracy. But we get very little history about all of this and overall I didn't have a very good grasp of the world's history, why their politics was so messed up, etc. And since the politics were a huge part of the book, that was a bit of a bummer.I sort of have a love/hate relationship with Sasha. She was okay at the very beginning, but as soon as she went into the parallel universe, she annoyed me. She cried a lot and she ignored common sense. I mean, I get that she was kidnapped and that's scary, but they laid out pretty clear terms and instructions for her and said they'd take her back if she followed them. They also said, "Hide your face because you're really recognizable here and it would be a really bad thing if people saw you." So she immediately ran out into the open, deliberately showed her face, and then people tried to kill her because of it. Yeah, nice job Sasha. But towards the end of the book, Sasha felt a lot more independent and sure of herself. She wasn't that teary, crying girl anymore. 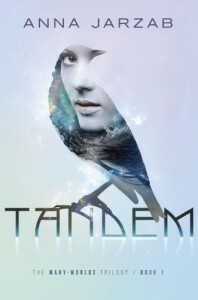 She actually took charge, uncovered secrets, and became a much stronger character.Overall, Tandem is definitely worth reading. It's an interesting book with a sweet romance, and it leaves off in a phenomenal place. The end of the book really picked up and hooked me in!